Since the beginning of 2011, we have been broadcasting on a new European AM/Medium Wave frequency of 1368 kHz, covering the North East of Italy (Venice, Padua, Verona, Vicenza, Bologna and vicinities, population around 3 million) from 7 PM until 2 AM Central European Time every night, and from 6AM until 8AM every day. 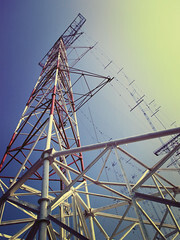 All broadcasts can also be heard in the border countries of Slovenia. Croatia, Austria, Switzerland, southern Germany and eastern part of France after 7 PM until 7:30 AM (nighttime) approx Central European Time. Listeners' letters on 1368 kHz have been received also from Spain, Belgium, Denmark and Sweden. The total potential coverage is approximately 143 million people, of whom ca. 68 million speak English as a first or second language. Nighttime coverage is approximately within the darker zone in the coverage map below, including the lighter area close to the transmitter). Daytime coverage is also available for programs in Italian (in the smaller, lighter circle in the coverage map). Over this new voice in Europe we are repeating some of the programs being broadcasted on European Gospel Radio, IPAR (International Public Access Radio) and IRRS-Shortwave on Shortwave, in addition to music, news and information in English. All programs on our AM/Medium Wave network are 95% in English. It's a great opportunity to make us heard in the center of Rome, just a few blocks from the Vatican, and in the large tourist and business areas in the North-Eastern part of Italy and Central/Southern Europe. Our system will call you within a few minutes connecting you to our office in Italy at no charge. If we are unable to connect, please contact us and we will call you or email at a later time.